This may sound stupid but about 9 weeks ago I was at the beach standing in the water. The waves were rough and knocked me down. My feet were sucked in the sand so my left knee twisted. i didn't hear a pop or anything. But right away I knew something was wrong with my left knee. It hurt to turn or twist the knee right away. 2 weeks later I went to the ortho dr. He ordered an MRI. 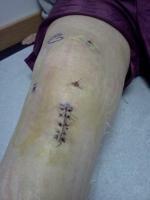 This showed no tears but he thought my kneecap had moved and strained my retinaculum tendon. I have been in therapy for 6 weeks now. I am getting strength back in my leg but still cannot walk normal as there is considerable tightness in the back of my knee and I cannot straighten my leg totally. Kinda feels like a rubber band tightening the leg. Dr. just says tendons take a while to heal. But I really would like to know if anyone else has had an injury of this sort.